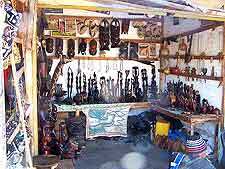 Art galleries in The Gambia are certainly not to be found in great numbers, and there really are only a handful that are of particular note, displaying the work of talented local artists. Most of these galleries feature a variety of African paintings and beautifully fashioned, highly tactile sculptures, which are often created from wood or stone, and usually fit perfectly into a suitcase - should you wish to purchase one or two! African art work from The Gambia really does make for a very memorable holiday souvenir. And even if you can't quite stretch to an original painting or limited-edition print, you may well be able to pick up a cheap postcard of a painted scene or an artistic photograph of a local landscape. The coordinator of the Mama Africa - Women's Museum and Art Centre ( formerly Mama Africa Art Gallery) is renowned Gambian artist Isha Fofana. Fofana has held numerous exhibitions in Germany and elsewhere in Europe, and over the years has gained quite a reputation and following. Isha Fofana's canvasses are usually large and extremely colourful, offering a contemporary interpretation of traditional African art. The Centre's Art Garden Restaurant offers local juices and African dishes for those wishing to take refreshment. Set up in 2005, the Lemon Fish art gallery was the creation of German curator Nina Effinger. Today, it exhibits and sells the artistic work of various local painters and sculptors. Exhibitions are regularly changed, ensuring that there is usually something fresh, different and interesting to see each month. The Tumbung Art Gallery was the brainchild of Baboucarr Etu Ndow, a local African artist from Bakau. It was originally opened in 2002 to foster local young artistic talent. Regular exhibitions are held, along with art workshops, which are usually very well supported and enjoyable.